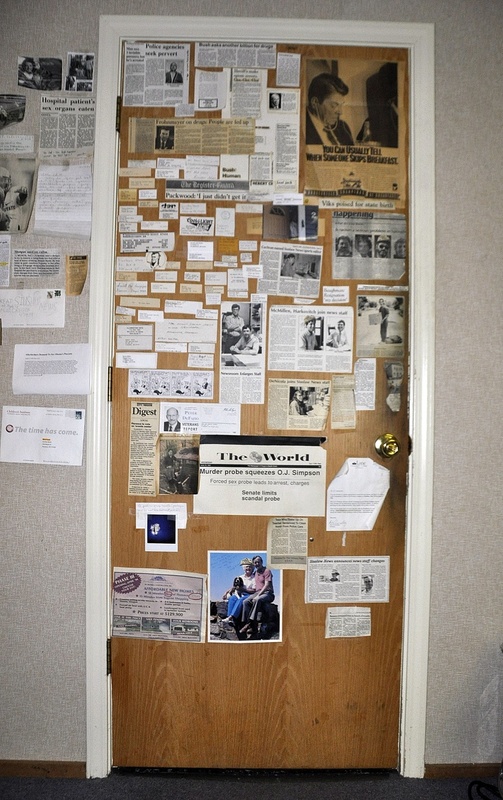 Our actual newsroom door — and the envy of Barbara Walters. To which she replied, “DWOP DEAD!” and hung up. So what is The Door (of Shame, Blame and Brilliance) exactly? Quite literally, it is a living, breathing piece of journalistic history assembled over 40 years by reporters here at Siuslaw News. That said, it’s no mere coincidence that the other side of The Door leads to the commode, where those same reporters have been depositing a different kind of history — and where, in a fitting twist, nothing living can breathe. Today, we have a new first on The Door: a two-part clipping, meaning that whoever put this piece together has earned the coveted “Twin Globes of Shame” award, which is named in part because of its rare “two-shames-in-one” distinction, and partly because the trophy once belonged to a failed cosmetic surgeon. Yet another fine example of how a good investigative journalist can mean the difference between stating the obvious or revealing what any five-year-old knows. Sadly, this might actually be the most original tip in the entire article. And there you have it. Now if you’ll excuse me, Barbara Walters is calling again. Crap yourself in a blanket. Glorious addition to The Door. And still excellent winter advice 17 years later. 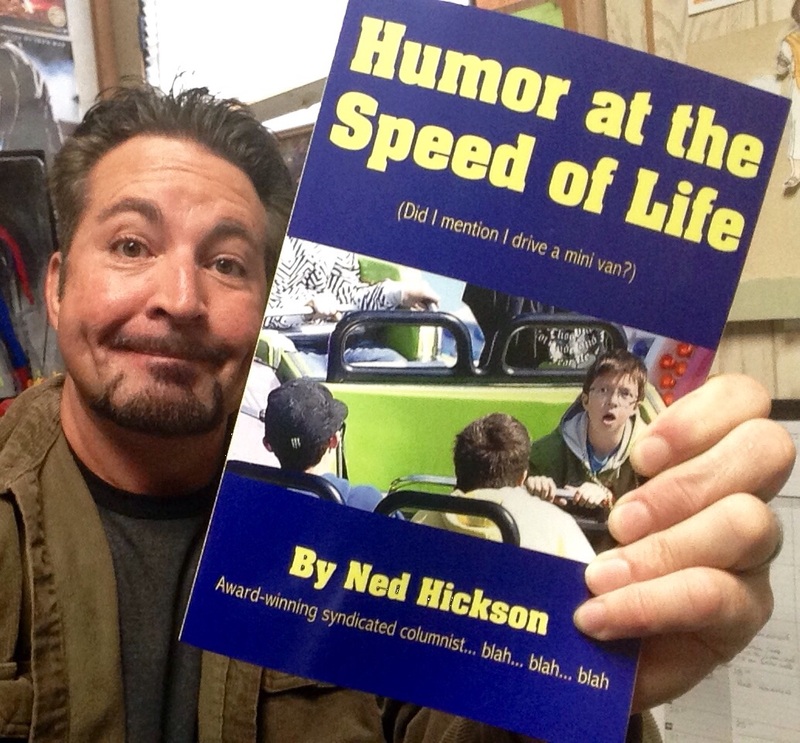 So glad the book finally got there, and thank YOU for being a part of doing something good for others, my friend. I was wondering how to keep warm during winter. Now I know! And knowing is half the battle. You should be careful Ned – out there somehwere are all the journalists and editors who actually published the door-worthy pieces. They could very well take offence and come after you. I here that editors especially are a pretty viscious crew. Oh it’s true Ned – I’ve actually seen pictures of some editors so mean that they wear witches’ hats. Actually, I think the “Barara Walters Warming Blanket” has potential, Lynette. lmao! Thank you for my belly laugh of the day. The thermostat: for those last resort situations when soiling yourself just isn’t enough to beat the winter cold. 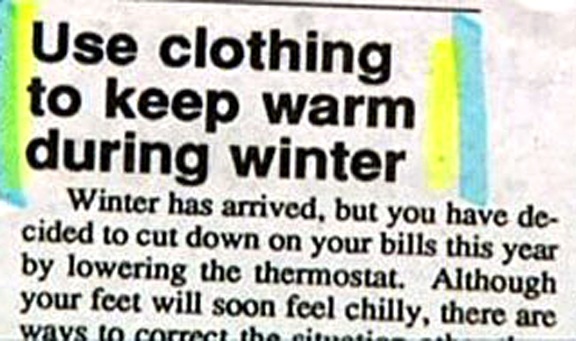 Duly noted for next time I’m sick or cold..
realism, i like that in my news stories. If chilly infants could talk, perhaps they’d tell the headline writer that the wet offsets the warm in No. 2, Ned. Wow, could that prompt another door-worthy head? I will hold a placee on The Door for that one, Mark! Nice to see the door making a return. Thank you for the Valentine wishes, Courtney, and the same to you and yours! This reminds me of a funny story that hails from the trenches, or should i say bowels, of the practice of law. A client once called and left me a voice mail expressing great concern about language he saw in a contract that excused performance for Acts of God and other events that are known in legal parlance as “force majeure.” He said, in absolute seriousness, “I want to talk to you about a clause in this thing that lets them off the hook for earthquakes, floods and, you know, force manure.” I was tempted to tell him that, if he experienced a force manure, determining legal liability would be the least of his problems. Haha! He didn’t work for Ex-Lax, did he? It’s always a pleasure to go through your door, Ned. 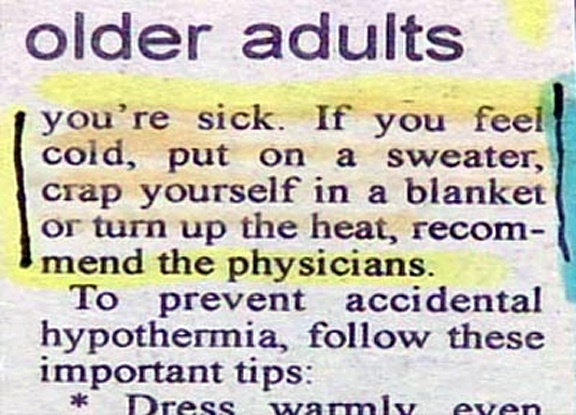 I’m all for using the physician’s heat too if it’ll save on fuel costs!